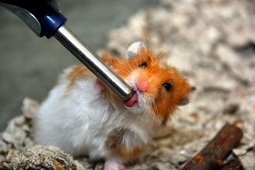 Should tap water be given to hamsters? In some countries tap water is purified, but in many other countries it is not. So before giving any tap water to your hamster, make sure that your tap water is drinkable. If not, then tap water should never be given to hamsters. In many countries, tap water is contaminated thus the safest type of water is bottled water. Water should be given to hamsters in a water bottle. Some hamsters may prefer to drink water from a shallow bowl but this tends to become more easily contaminated with bedding and germs, thus the easiest and safest way is a hamster water bottle.